Delete cells, columns, or rows in a Word table by using the right-click menus. If you want to delete an entire table, see Delete a table. Right-click in a table cell, row, or column you want to delete. On the Mini toolbar, click Delete. 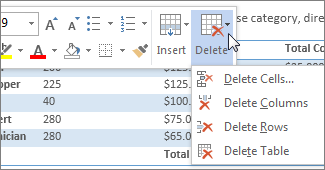 Choose Delete Cells, Delete Columns, or Delete Rows. Tip: You can delete the contents of a table row or column without deleting the table structure. To do this, select the row or column and then press the Delete key. On the menu, click Delete Cells. To delete one cell, choose Shift cells left or Shift cells up. To delete the row, click Delete entire row. To delete the column, click Delete entire column. Tip: You can delete the contents of a row or column without deleting the table structure. To do this, select the row or column and then press the Delete key.